Early morning sunshine gives us hope for nice weather for our first day on the road. Today we travel to Hyden, with planned stops at John Forrest National Park and the Wheatbelt Flora Garden (Centennial Park) in York. After entering the John Forrest Nat Park it was hard for me not to jump out the window as we drove, what seemed for ever, past all these plants I was seeing for the first time, before finding somewhere for the bus to park. When I stepped off the bus my excitement nearly tuned to panic when I realized that all the colours in front of me were from plants that I had not seen before, and I didn't know which one to photograph first. A bit further on Angus spotted flashes of red and green, and it was off the bus to inspect the road-side for the Red and Green Kangaroo Paw, the floral emblem of Western Australia, Donkey Orchids and other fantastic flora. I was now beginning to understand how Joseph Banks must have felt when he first landed at Botany Bay. It was then onto York to visit the Flora Garden which showcases the flora we should be seeing when we get into the wheatbelt proper. York was also our lunch stop for the day. Approaching Quairading a carpet of pink daisies caught our eyes and Martin once again pulled over. We were all soon out, over the train tracks and happily in amongst one of WA's iconic wildflower displays. We then traveled onto our accommodation for the night at the Wave Rock Motel, Hyden. The videos can only be watched on this page. 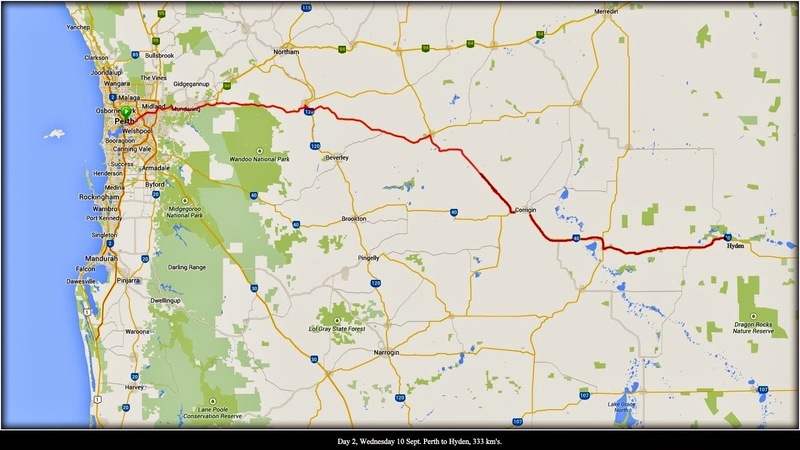 Day 2, Wednesday 10 Sept. Perth to Hyden, 333 km's. The morning sun seen from our room shows that it might be a better day. Time for an early morning walk before the bus leaves. Looking towards the Narrows Bridge and King's Park. Another couple of early-birds, Darter and Long-billed Corellas. Laurie gets a photo of the stampede once the door of the bus is opened. There will many plants that I won't be able to name, this is the first of them. ............. and there were blues, Lechenaultia biloba - Blue Lechenaultia. Calothamnus sp. - One Sided Bottlebrush, Net Bush. Chamaescilla corymbosa - Blue Squill. A lone wattle flower amongst the hakea. after reading an article on them . The first of the many species of Native Peas we were to encounter. Something in the Myrtaceae family. Where do I start? Oh, thanks Lorraine, a litle higher and to the left. I love the feathery flowers of the Leucopogons. Members of the Drosea family, Sundews (carnivorous plants). Close up of the Calytrix. Here they have several species, in different colours, where we in the east only have one. Millotia sp. Hey, it might not be pretty, but that's no reason not to takes it's photo. One of the many native peas. John Forrest National Park was a great place to start, I didn't want to get back on the bus. Second Stop - Flashes of red and green. Flashes of red and green beside the road soon had the bus pulling over. yellow of a Synaphea sp and white of a Stackhousia sp. What a standout flower is the Red and Green Kangaroo Paw (Anigozanthos manglesii). The Red and Green Kangaroo Paw was one of the main target plants, it's easy to see why. Neil focusing in on a pea while Jean and Jan have found something wonderful on the other side. The Isopogons over here are something else. A spider waits patiently in this Stackhousia flower spike. Gumnuts, we get to see plenty of these. Donkey Orchids - Diuris sp. The leaves of this Triggerplant caught my eye. Thysanotus patersonii - Twining Fringe-lily. Pea flowers and yellow Synaphea. Third stop - York, Wheatbelt Garden and lunch. Acacia aphylla ---Leafless Rock Wattle, Reindeer Bush. I never thought that I would see Lynn taking such an interest in photographing native plants. Some of the captive beauty of the Wheatbelt Flora Garden. area of any such building in Western Australia. York is the oldest inland town (1831) in Western Australia and was named after the city of York in England. Castle Hotel, 1862, is the oldest existing inland hotel in WA. Eucalyptus Macrocarpa - Rose of the West, growing in front yard of cottage. This mighty Eucalypt provides welcome shade in the Settlers' Village Courtyard. Damage from the October 1968 earthquake. Fourth Stop - Quairading, a sea of pink. This was the last big patch of everlastings we came across. The wheat fields now cover the land where these once flourished. Rhodanthe manglesii - Pink Sunray, Mangles' Everlasting, Timeless Rose. Marlene tip-toes through the daisies. Rhodanthe manglesii - Pink Sunray, Mangles' Everlasting, Timeless Rose. All together for a group shot. A happy Angus. "The best it's been for years". Luckly, Lynn was able to find a rock to stand on to see above the flowers. Angus had a ladder. It truly was a marvelous sight. We were all happy with our find. Waitzia acuminata - Orange Immortelle, amongst the Pink Sunray. Bed for the night at the Wave Rock Motel at Hyden. The 'scratchy bum' plant. Trying to discourage use of the toilets and save water. A nice yellow Eucalypt flower. To go back to Day 1 click: here.